In small bowl, combine blueberry jam with water to thin; set aside. In banana split dish, spread whipped cream and drizzle with blueberry sauce. Place banana halves on the whipped cream and blueberry sauce. Top bananas with three scoops of chocolate ice cream and sprinkle with shredded coconut. 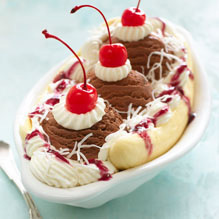 Garnish each scoop of ice cream with a dollop of whipped cream and a cherry.